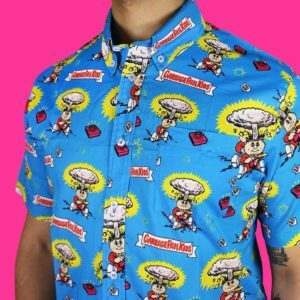 Is the GPK world ready for designer shirts and hoodies? 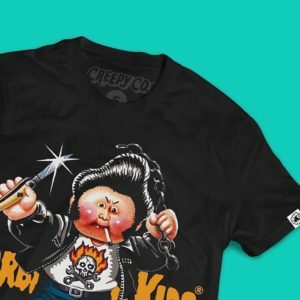 We are about to find out, as designer clothing company Opening Cerremony has begun offering Garbage Pail Kids merchandise. Thanks to GPK collector Michael White for first pointing these out. The company sells online and has stores in New York, Los Angeles, and Tokyo. Launched in 2002 they work with designer brands offering a wide variety of clothing. 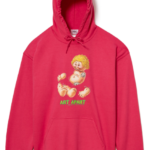 They launched what they are calling a line of limited edition t-shirts and hoodies. 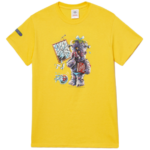 There are four t-shirts; a blue shirt featuring New Wave Dave, an orchid shirt with Furry Fran, a yellow shirt with Creepy Carol, and a white shirt with a GPK and OC logo on the front and the same three characters along with Art Apart on the back. 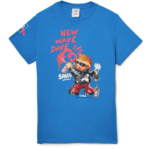 All the shirts feature different forms of both the Garbage Pail Kids banner and Opening Ceremony logos on either the front or back. The t-shirts are available in S-XL, and are priced at $60 each. 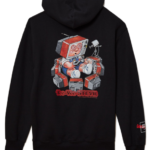 They also launched two hoodies. 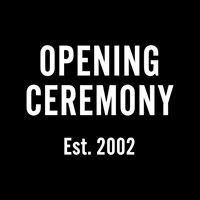 One black hoodie featuring Tee-Vee Stevie on the back, and an Opening Ceremony logo on the front. 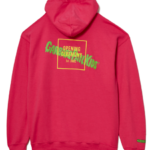 The second hoodie is pink and has Art Apart on the front with GPK and OC logos on the back. 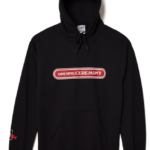 The hoodies are also available in S-XL, and are priced at $120 each. All clothing is officially licensed by Topps. 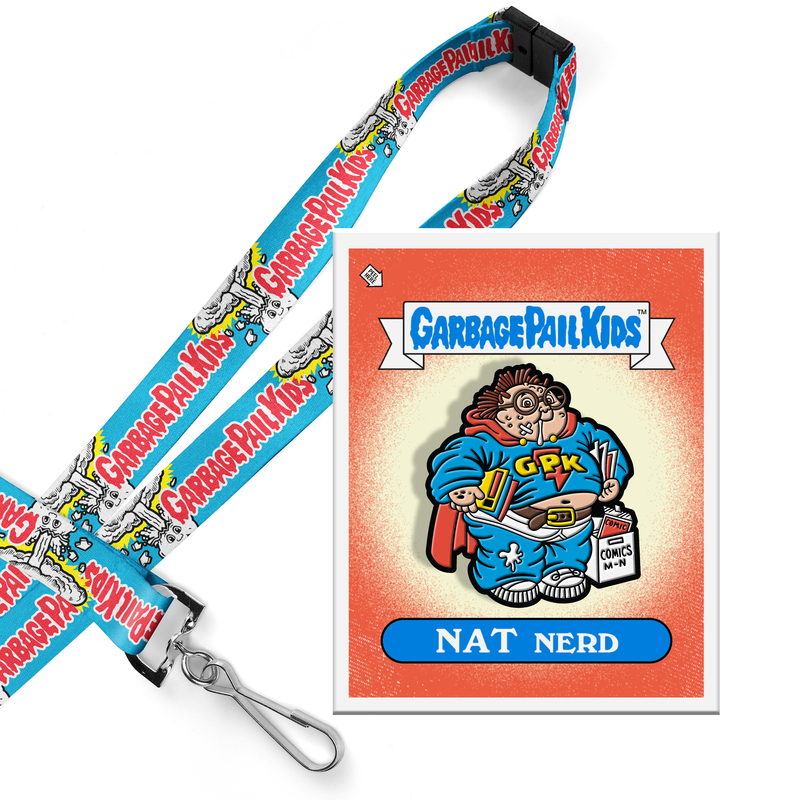 The company says as of now this is the only GPK merchandise planned. Update 7/16/18 – Topps revealed via Facebook today that the three prints will now be available in 8 x 10 size, and come with three different backgrounds. White ($15), Transparent ($20), and Foil ($25). This info differs with what Atomic Toybox released previously. 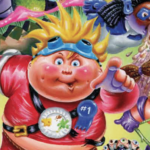 Topps and Garbage Pails Kids have a long history of making an appearence at the country’s largest Comic Con. This year will be no exception. Thanks to GPK collector srezvan for first pointing out this years exclusives. 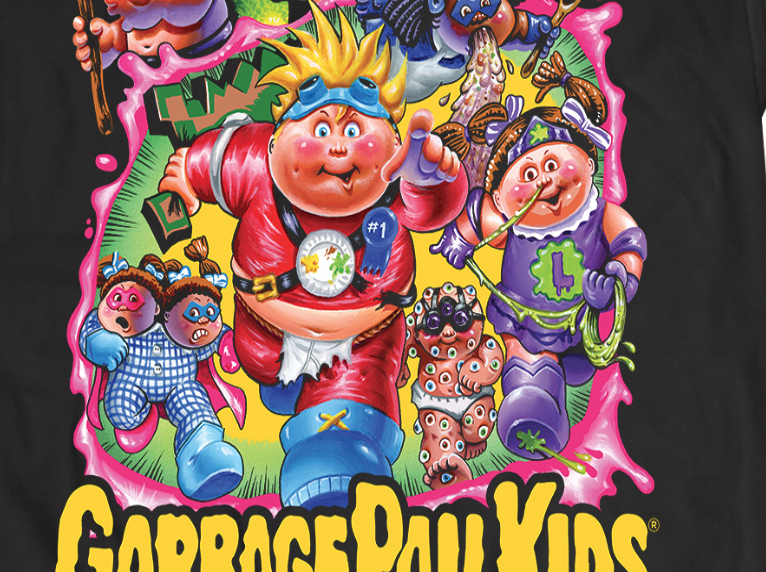 Topps, Creepy Co., and Atomic Toybox are teaming up to offer a number of exclusive GPK items. 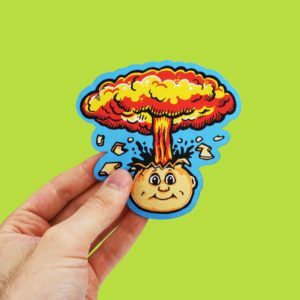 Atomic Toybox will once again be the booth (#3921) where these GPK items will be for sale. Here’s what will be offered. Topps will have three Jumbo Stock Card Art Prints. These poster sized cards measure 11 x 14. The officially licensed art was done by GPK artist Joe Simko. Each card will be produced in limited quantities for the show. Exact production numbers have not been revealed. Each jumbo card will be available for $20. The art for one of the cards will also be offered as a t-shirt. 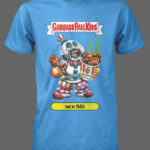 The shirt is licensed by Topps and produced by Creepy Co. Also available in limited quantities, the shirt will sell for $35. 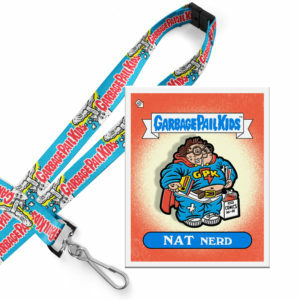 Finally, Creepy Co. has produced an enamel pin of Nat Nerd along with a GPK lanyard. The pair will sell for $15. This year’s San Diego Comic Con is set to take place from July 19-22 at the San Diego Convention Center. 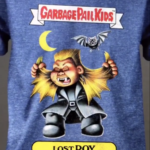 After taking a break from GPK products for a couple of years, earlier this week Fright Rags begun teasing four new Garbage Pail Kids t-shirts. Today Fright Rags shared details with GPKNews on everything they have planned for their upcoming release. As previously teased, they will be offering four new t-shirts based off of brand new licensed artwork from GPK artist Brent Engstrom. 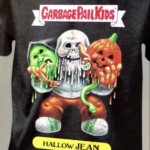 Hallow Jean and Jabbed Jason will be available in Dark Heather, Sick Sid will come in Heather Caribbean Blue, and Lost Roy in Heather Royal Blue. All four shirts will be available in sizes S-3X. Pricing for the shirts will be $27 each. That’s not all, Fright Rags will be bringing back a favorite character from the past. Fright-Rag Freddy will be available in a couple of different configurations. The artwork, also done by Brent Engstrom, was not only sold by Fright Rags as a t-shirt, but also appeared in 2014 Series 2 as a bonus card. Fans who missed out the first time will have their chance to purchase new merchandise featuring the character now. Fright Rags will offer a Fright-Rag Freddy – T-Shirt Wax Pack. Limited to 200, the pack will included a Fright-Rag Freddy – Ringer Tee, Enamel Pin, and a 5×7 Trading card. The shirts will be available in Men’s sizes S-5X, and Women’s XS-2X. The pack will be available for $40. 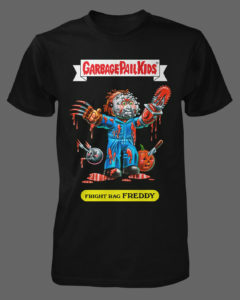 The Fright-Rag Freddy – Ringer Tee will also be available individually for $29. Finally, Fright-Rag Freddy will also be available on socks. Limited to 190 produced, the socks will cost $12. All the Fright Rags merchandise is set to launch on Wednesday, July 18th. 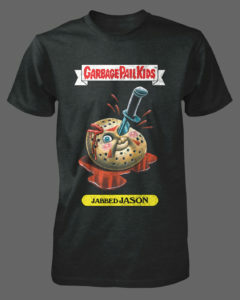 Between Fright Rags, Creepy Co., and the San Diego Comic Con, July is shaping up to be a big month for GPK merchandise. 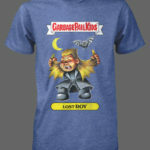 Fright Rags is not new to the Garbage Pail Kids scene. 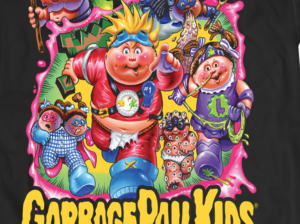 They have a history of offering GPK themed shirts in the past. Their last offering was in 2015. Today on their Instagram account Fright Rags teased four new shirts. The four shirts feature brand new officially licensed artwork done by artist Brent Engstrom. Brent has also done art on previous Fright Rags offerings. 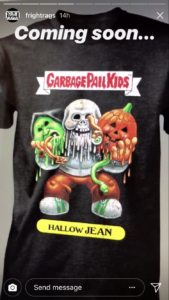 All shirts also feature the Garbage Pail Kids banner along with a name plate at the bottom. No other information has been revealed from Fright Rags as to pricing, pre-orders, or release date. 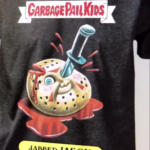 As of right now the horror themed GPK artwork on the shirts is not scheduled to be featured in the upcoming GPK Oh the Horror-ible set. Of course down the line Topps could change their tune and offer the artwork as cards. Update #1: Tuesday night Creepy Co. announced on their social media accounts their Adam Bomb Bottom Up 2.0 shirt. 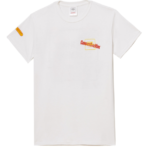 The shirt is similar to one previously offered with a couple of changes. The colors are bolder and more vibrant than the first version of the shirt. The new version also has a pocket. The shirt will launch along side their other new shirt this Wednesday at 7:00 PM Central time. Fresh off offering two GPK themed shirts and a patch last week, Creepy Co. has again begun teasing a new shirt. 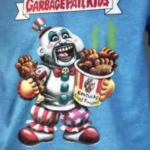 This evening on their social media accounts they posted a picture of a shirt featuring the artwork for Greaser Greg. 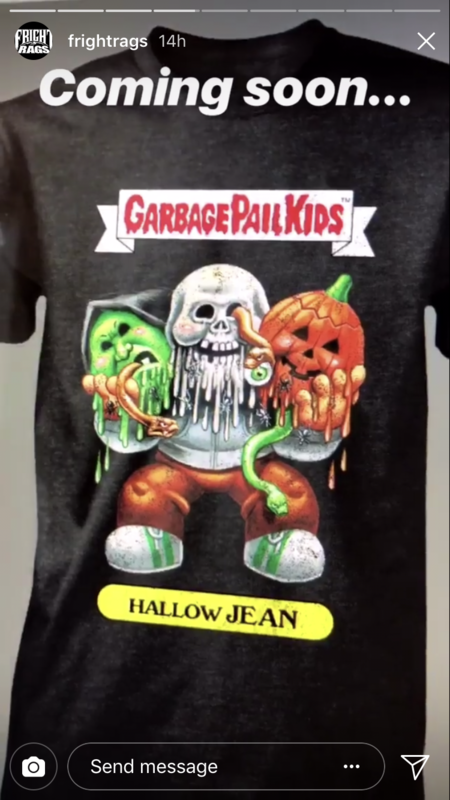 The all black shirt also features an orange GPK banner under the artwork. 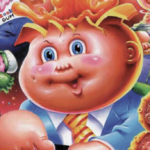 No other mention of GPK products, but knowing Creepy there could be more to come. Expect the short to launch during their normal Wed. 7:00 PM (Central) release window next week. Update #2: Creepy Co. also revealed a Adam Bomb patch will go on sale this Wednesday along side the two new t-shirts. Get those credit cards ready! 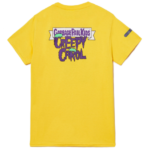 Update #1: Creepy Co. revealed the second shirt they are offering. 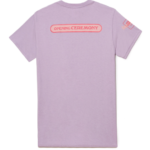 The all pink shirt features the Adam Bomb pack art from OS 1. Creepy also teases there are more Reveals to come. 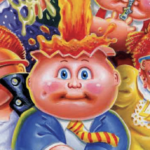 Creepy Co. continues to make use of their GPK license. 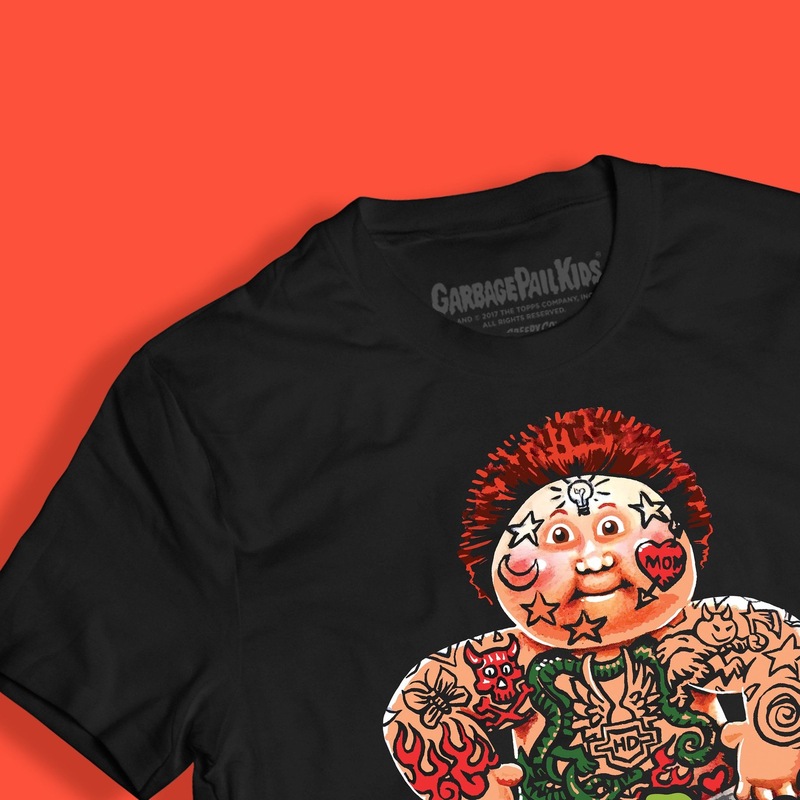 Earlier this evening the company posted a teaser to their social media accounts announcing they would be launching two new Garbage Pail Kids themed shirts next Wednesday, 6/13. 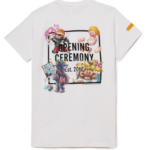 The teaser shows one of the shirts that features the art from the OS 2 80a/b Tatoo Lou/Art Gallery card. We will update this post as more info becomes available. 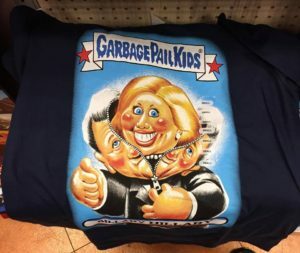 Wear Your Favorite GPK Candidate! Thanks to collector Stephen Sodergren for being the first to point these out. It looks like you can now wear your favorite Garbage Pail Kid Presidential Candidate. Using artwork from the New Hampshire Presidential Candidates online set, both Donald Dumpty and Billary Hillary have been made into t-shirts. The shirts appears to be in only FYE stores right now, as multiple collectors are finding the shirts there in the past week. Go out and support or not support your favorite candidate! Fright-rags.com will be offering pre-orders on their next batch of shirts. The shirts feature officially licensed art drawn by Garbage Pail Kids artist Brent Engstrom. 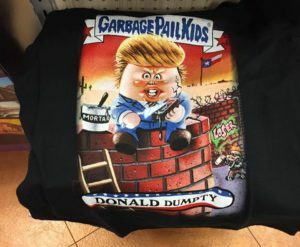 If I’m not mistaken this is the sec don batch of GPK shirts Fright Rags has done. If you are interested pre-orders start on May 27th right here.